The Cleopatra Mountain Farmhouse in KwaZulu-Natal invites guests for a romantic getaway to the midlands in Mooi Rivier for picturesque views of the Drakensberg. Accommodation Eleven individually decorated rooms. In the midlands of the Drakensberg, neatly tucked away in Mooi Rivier in KwaZulu-Natal, rests this little sanctuary known as the Cleopatra Mountain Farmhouse. Guests are invited to stay at this farmhouse to experience true country living. The lodge is a 2 hour drive from Durban and 5 hours away from Johannesburg. Attention to detail is placed in each room with a few personal touches that the family collected from their worldly travels. On stormy days, the farmhouse lounge area is where guests get to enjoy fragrant cups of coffee and rich slices of chocolate cake. 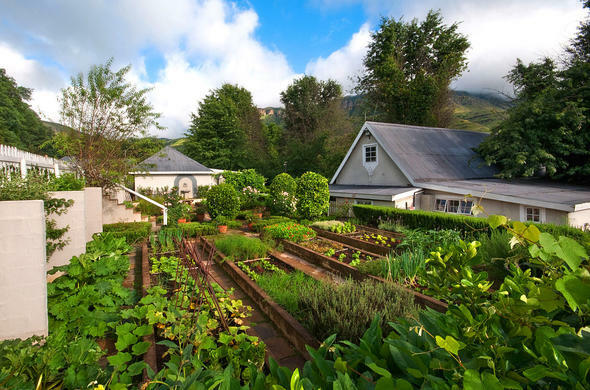 Embark on walks around the farmhouse to the garden where aromatic herbs and flowers reside or they can source the fine selection of South African wine at the underground wine cellar. A number of activities that contribute the country lifestyle at the Mooi Rivier can be arranged for the enjoyment of guests. Horse riding and fishing are among afternoon activities guests can delight in. The farmhouse helicopter can take guests on flights over the picturesque midlands during sightseeing excursions. Guests can visit the Pioneer Room to savor breakfast, lunch and dinner. The farmhouse management and staff strive to bring guests an unforgettable experience through their rustic luxury accommodation and delicious cuisine. Romantic weddings and special events can be celebrated at the Cleopatra Mountain Farmhouse. The setting created by the Drakensberg, lakes, rivers, and waterfalls makes the farmhouse the ideal wedding venue.